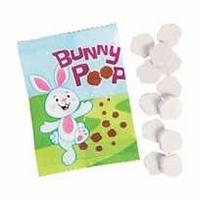 Bunny poop is the perfect novelty Easter candy for putting in your Easter basket. Hard pieces of candy with a strawberry flavor. Bunny poop is just a fun little candy, great for office parties to give as a gag gift. Buy bunny poop for your Easter basket, who said the Easter Bunny can only bring eggs ? You get 6 small packs of bunny poop , each pack as about 12 pieces of candy.